Ant-mimicking Seed Bug II - Daerlac sp. This page contains pictures and information about Ant-mimicking Seed Bugs that we found in the Brisbane area, Queensland, Australia. 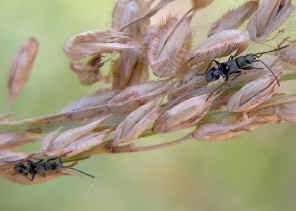 The nymphs were found on grass seeds. This bug species in ant-mimicking. Ants are the most abundant group of insects and have powerful defence mechanisms such as acid taste, aggressive biting, painful sting, and group defence. Ants are generally not subject to predation. They are the ideal models in mimicry rings. 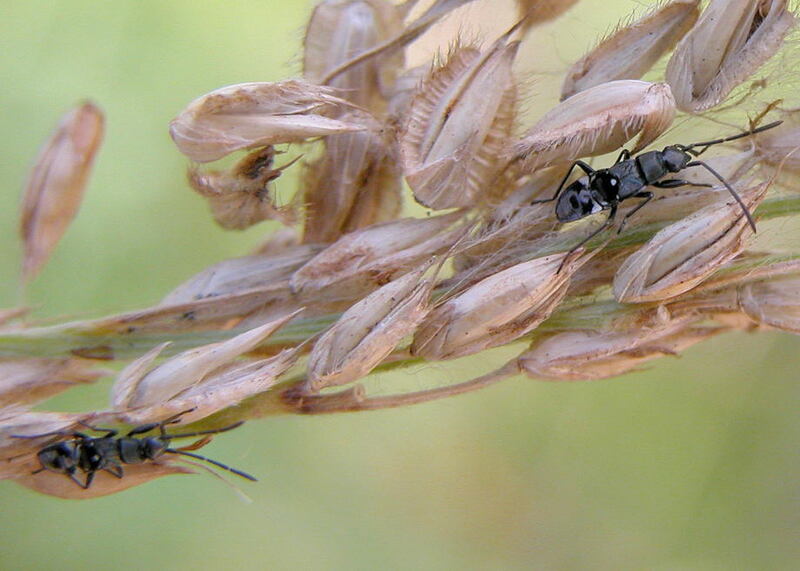 Many insects and spiders have different ways to resemble ants. This is known as Myrmecomorphy. 2. Insects of Australia, CSIRO, Division of Entomology, Melbourne University Press, 2nd Edition 1991, pp 501. 3. Family RHYPAROCHROMIDAE - Australian Faunal Directory, Australian Biological Resources Study. Last updated: February 12, 2012.